Part of It Gets Imprinted! We were super pleased to find an image of the Alphabet shirt that Daniel Eatock designed for Gluekit’s Part of It project in his brilliant recent monograph Imprint (2008). For more insight into Eatock’s meticulous practice and his projects, check out Eatock’s website and, in particular, the section on Imprint itself. Part of It is proud to present “Logika Neutrala Facila,” a new design by the esteemable Stuart Bailey (of Dexter Sinister and Dot Dot Dot fame) now available at a special PRE-ORDER price from the PoI website. We’re thrilled to welcome Mr. Bailey to the project! He’s chosen the Holy Apostles Soup Kitchen in New York City to receive a portion of the profits from sales of this design. HASK does truly important work, serving meals to some of New York City’s neediest folks, and offering a range of services that can be a lifeline to those on the streets. We’re very happy to announce that Part of It will be celebrating Daniel Eatock’s “Best Before October 26, 2008” project, which he created to coincide with the closing of his exhibition at Arcadia University in Glenside, Pennsylvania (just outside of Philly). We’re hosting a sale of Eatock’s “Alphabet” shirt at a special price but the sale will end on October 26. This weekend we stopped by his exhibition, “Extra Medium,” which is Eatock’s first solo show in the United States. Happily, we also were able to pick up his new book, Imprint, which features his life’s work thus far and, to our happy surprise, includes his Alphabet design for Part of It! Adrian Johnson’s wonderful “Resistance is Fertile” design is now available on totes and t-shirts at Part of It! These are perfect summer items with a terrific message and a smart graphic. The bags are printed on natural totes ($20.00); tees are silver grey in a variety of Unisex sizes ($28). Adrian’s selected WWF to benefit from sales of products with this design. We love the new totes and tees, and hope you will too! We’re proud and very happy to announce that Wyeth Hansen’s design for Part of It, “Make Some Noise!” is now available on both natural tote bags (above, $20) and comfy unisex t-shirts ($28). The shirts are a bright white tee, which is perfect for summer sporting! It’s a really sparkling design sure to amp up enthusiasm wherever it goes! A portion of the profits will go to Wyeth’s chosen recipient, the Fresno Arts Council in Fresno, California. Available now at Part of It. Check it out! Threadless “True Love” On Sale! By the way, the design we did for Threadless is on sale this week as part of their giganto Summer Blockbuster Sale for a delicious $12.00! We just got ours in the mail today and are so happy with the way they turned out. We hope you will be too if you decide to order one– Threadless prints in separate editions so this is your chance to snap up a first edition of the tee! Wow! We are super super SUPER excited to have been asked to be part of a special Threadless & Timbuk2 team-up! Above is the limited edition Gluekit messenger bag (only 200 made!) 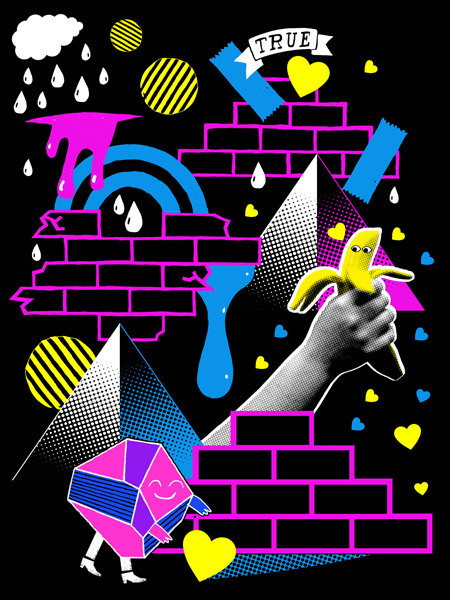 produced by Timbuk2 as part of their Threadless artist team-up. We are super pleased with the way the all-over design print took to the bag and hope Timbuk2 customers will be too! For those who can’t afford the $150 dollars for the bag, the design is also available in a wide range of super comfy tees from Threadless. We’re honored to be part of their Select line!